Often puppies just don’t “get it”. They become extra mouthy, wiggly, unfocused and reactive. What if their behavior was due to their overall view of the world and people as “unsafe”? Teach your clients skills to help these pups get a more positive view of their world. Help! The Dominance Paradigm is Holding Me Down!! Wild Puppy to Wonderful Puppy! 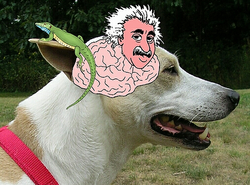 Using simple focus games to change a puppy (or grown dog) from a monster lizard brain to a focused Einstein. Beth covers the training games in her book. This seminar in an outstanding hands-on workshop for training clubs. Most clubs choose to make this a two-day event. Are dogs really wolves? Where did they come from anyway? What can we learn from dogs' wolf cousins that can help us better live with our domestic canine buddies? 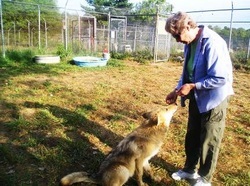 Watch an online presentation done by Beth: Wolf Behavior - How it relates to training dogs. All of these programs are guaranteed to be lively, interesting and thought-provoking. Beth can tailor her program to meet the needs and time constraints of your group.